Take sixteen dice - six of one colour and ten of another. Here we use blue and red. there is always a difference of two between the numbers on the blue and red dice. What are the possible arrangements when you choose your own numbers for the dice using the rules above? What is the total for each of these arrangements? What do you notice about your arrangements and the corresponding totals? Explain what you notice. What else do you notice? Can you prove any of the things you've noticed from the main challenge are always true? Instead of having a difference of two between the numbers showing on each face of the blue and the red dice, choose a new difference. Now, what totals can you find? What do you notice? Explain what you notice. Can you predict - without having to make them - what numbers need to be on the faces that you can see on the blue and the red dice to make a total of 42? Are there more ways to make a total of 42? 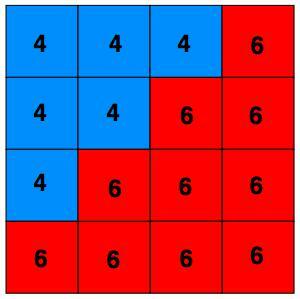 What happens if you change the number of blue and red dice yet keep the structure the same? It must be a square and both sets of dice must still make triangles. This problem featured in a preliminary round of the Young Mathematicians' Award 2014. Factors and multiples. Place value. Dice. Investigations. Multiplication & division. Working systematically. Addition & subtraction. Trial and improvement. Generalising. Making and proving conjectures.